As an American traveling in a foreign country, the last thing you want to do is stand out like a sore thumb. Not only do you have a greater chance of getting sucked into tourist traps, but you're also a more obvious target for getting mugged or even kidnapped. So, are you aware of the things you do, say, and wear that make you look like the stereotypical tourist? 1. Ditch the athletic shoes. White athletic shoes (otherwise referred to as tennis shoes, or sneakers) are stereotypically American. Any shoes that don't look like they were meant for exercise will suffice. If you do wear socks, make sure they're dark. Flip-flops are also very noticeable as American attire, unless you're in a country like Brazil where Havaianas reign, or Australia or New Zealand where the Brazilian flip-flops are also ubiquitous. 2. Buy accessories at local stores, especially ones that you see the locals wearing, like scarves. Sometimes not wearing something could signal that you are a tourist. For example, in some countries, hats or scarves are worn by the majority, or, in winter, most people might wear neck scarves. Also, head scarves in some religious establishments. It would be wise to research this in advance and be prepared to take something with you if you plan to visit religious places. 3. Avoid US brand name clothing with easily readable names (eg. Nike, Gap, Abercrombie, Patriotic, Texas A&M, etc.). In fact, don't wear any slogans (like "Virginia is for lovers") that will tie you to a specific place. Notoriously American brands are becoming more popular outside of the US due to globalisation, however, it's still a good idea to stick to non-slogan clothing. 4. Dress a little nicer than usual. Casual dress (wearing sneakers, sweatshirts, t-shirts, jeans, or shorts (especially athletic shorts) instead of slacks or skirts with shirts or blouses) is not as common outside the US. Jeans are not universally accepted as appropriate in all social situations. Take some pairs of trousers or slacks in lieu of jeans. Adults, especially women, should not wear shorts. Look around and see whether people tuck their shirts in, or leave them hanging out--sometimes this differs for men and women in the same country. 5. Dress appropriately for the local weather. Shorts and a t-shirt in cool climates (or winter time) are a clear sign that you are not in touch with the local weather. 6. Camouflage. What colors do the locals wear? Mostly black and other neutral shades, like in London, or bright, bold colors like in the Caribbean? Wear colors that you see the locals wearing. Folks in Paris, London, and other European capitals tend to wear lots of black, and as a tourist, you tend to blend in if you’re wearing it, too. Your hot pink sweater vest or bright blue collared shirt might be fashionable in Minneapolis, but it won't fly in Budapest. 1. Take whatever condiments they give you. Requesting typical US condiments (ketchup, salt, pepper, etc.) is a sure giveaway that you are an American tourist. Use the typical condiments in your host country, and if you don't like them or can't bear to eat without your American condiments, bring your own. Take small packets with you to use rather than insisting that the restaurant supply you with it. 2. Give up the ice. In many parts of the world, you will be served your drinks with little or no ice - much less than you're accustomed to in the US. Of course, if you want ice in your drink because that's how you prefer it and you're paying for it, you're perfectly entitled to ask for it...but the point of this article is to help you avoid being labeled as an American, and requesting ice is a definite giveaway, and be warned, the drinking water of some other countries aren't as safe as the water back at home... the water in the glass might be filtered, but the ice sometimes isn't, and with that you can get a bad case of food poisoning. 3. Eat local food. Many American tourists visit US chain restaurants for every meal, afraid to dabble in the local cuisine, but becoming a regular at the local McDonald's and Pizza Hut will tip everyone off that you're an American really quickly. 4. Use local table manners. * In Europe, a fork and knife are used differently than in the US. If you are right-handed, eat with the fork in the left hand and the knife in the right. Europeans cut each bite individually with the knife in the right hand and the fork in the left hand, and rest their arms midway between wrist and elbow. The elbow should stay off the table. * In some Asian nations chopsticks might be more appropriate than a knife and fork. 5. Order like a local. In some countries, for instance, a salad is the last item served, not the first. In others, people don't eat what we in the US think of as a "salad". 6. Don't request decaf unless you can see in the menu that it is offered. 7. Don't ask for a seat in the "non-smoking" section, unless you already know there is one. 8. Don't insist on drinking “Coke” with every meal. 9. Avoid walking down the street while eating food. * If you must use a dictionary to translate a sign or menu, be discrete. For example, copy down the words of the sign and move aside to a less public place to work out the translation. * Don't carry US newspapers, magazines or books in plain view. 2. Be quiet! Many Americans are recognized for being louder than is customary in other parts of the world. Large arm and hand movements and boisterous behavior should be avoided until you know how the locals act. Adults in many non-American cultures use lower voices in public places. Either way, you're always better off being a little more reserved and quiet, at least for starters, than blasting onto a foreign scene with your vitality and making the wrong impression. 3. Don't brag or be showy. When you pull things out of your bag in public to show your friends or family what you purchased, you might as well yell "I have money and I'm ready to spend it, unless you want to take it from me against my will!" 4. Avoid talking about the local people and culture. Something as seemingly harmless as "Oh, I just love the scarves here!" will mark you as a tourist. And don't assume people can't understand what you're saying, just because you said it in English. In many parts of the world, people are taught to speak English along with their native language. 5. Mind your personal space. Not every country is as "spacious" as the US (unless you're in New York City, where space is at a premium). When you're at a counter, for example, don't spread out your arms; when you're sitting down on the bus or train, don't stretch out your legs in a way that might get in someone's way. 6. Hands in Pockets. If you are touring a religious place or a place of great national pride, it can be considered very disrespectful to have your hands in your pockets. 7. Don't chew a lot of gum. It's just not very common outside of the US, and even within the US, it's a breach of etiquette under some circumstances. 8. Don't wear your camera around your neck. When traveling to a foreign country, you are bound to take pictures. However, having a camera strap and wearing it around your neck for easy access is a sure way to look like a tourist. If you can, keep it in a pocket or in a purse and pull it out when needed. 9. Try to speak the language. Why not try to make an effort to speak the local language? It's a sign of respect and appreciation of the local culture. Learn a few basic words like "Hello", "Please" and "Thank you". Nobody will mind if your accent is not perfect; the fact that you've been willing to speak their language, even when you could well have spoken yours, is a thing that many people appreciate in tourists. 10. When shopping in Europe, ask the shopkeeper to see items on the shelf -- do not handle them yourself. Also, it is generally considered polite to greet the shopkeeper when entering the store if you are the only shopper. * These are only guidelines. 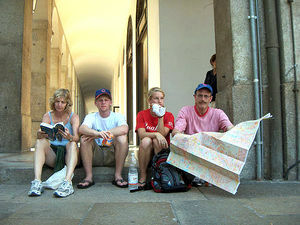 You can do whatever you want as a tourist, but this article outlines some things you might want to avoid doing if fitting in and avoiding unwarranted attention is a concern. * In the UK, most men wear closely-fitted, dark clothing. If you are visiting during winter months, a snugly-fitted jacket will help you blend in with the local crowd. * Avoid wearing a baseball cap. * If you are traveling alone, especially a woman, buy the local newspaper and keep it under your arm when walking, or open it if on a bus or train. * Always buy a pair of local shoes - especially what people wear for comfort. * Don't wear a fanny pack. Not only do fanny packs scream "Ugly Americian", they also make you a ridiculously easy target for pickpockets. A pickpocket could easily unzip the fanny pack and take out the contents without you being aware. Furthermore, fanny packs are outdated by a decade and look ridiculous. * If you look different (like if you have different color skin, or are more overweight or underweight than everyone else) people are going to think you're a tourist, or at least a foreigner, no matter what. But if you follow the steps above, hopefully they won't think you're a stereotypical American tourist, and they won't treat you as such. * It is best to wear your personal items such as money, ID, passport, credit card, etc. close to your body. You may not feel someone pulling objects out of your pocket. Inner pockets, or pockets on the front are easier to guard. Thats it :) Share your tips if you have any! Very interesting and helpful. Someday I hope to travel more and put this to good use. Thanks! ...and lamentation--it's sad that it's an embarrassment to be labeled as an American in other nations. Thanks, republicans and religious nutbags. I do have a question pertaining to the post--I carry a backpack or some sort of bag everywhere I go. Would an over-the-shoulder or across-the-chest type of bag do in place of a backpack? I always thought they looked more tasteful. I already wear black 90% of the time, hate ice in my beverages, don't switch my fork to my right hand when cutting meat (am I the only American who doesn't? It never made sense to me and seemed unnecessary--why should there be an extra step between getting the food on the fork and getting it into my mouth? ), am quiet by nature, rarely, if ever, chew gum, and am currently learning German (although I must admit I've become a bit lax with this--I need to catch up) so I'm partway ready for a trip to Europe (well, Germany, at least) already. Also, this makes me think of David Sedaris' story "Picka Pocketoni" in his book Me Talk Pretty One Day, about his encounter in Paris with two American tourists who broke a majority of the "rules" above. It's hilarious. Oh, and re: Frink's comment: I'm wondering about that as well. I don't carry a backpack and I wouldn't be caught dead with a fanny pack (hello, 1991!) but I carry my Beirut (it's a band) tote bag everywhere. It's good to know that the way I cut meat is correct in Europe. I always thought I was just weird.